My dear brethren and sisters, I thank the Lord that He in His kindness has permitted me to join with you in another glorious general conference of the Church. How I have been blessed as a result of your faith and prayers during the past few months. My heart has been touched as I have learned of the many children, youth, and adults of the Church whose lives are being changed by the study of the Book of Mormon. You are helping to cleanse the inner vessel. God bless you for it. The great test of life is obedience to God. “We will prove them herewith,” said the Lord, “to see if they will do all things whatsoever the Lord their God shall command them” (Abr. 3:25). “Come unto Christ,” exhorts Moroni in his closing testimony, “… and love God with all your might, mind and strength” (Moro. 10:32). This, then, is the first and great commandment: “Thou shalt love the Lord thy God with all thy heart, and with all thy soul, and with all thy mind, and with all thy strength” (Mark 12:30; see also Matt. 22:37; Deut. 6:5; Luke 10:27; Moro. 10:32; D&C 59:5). It is the pure love of Christ, called charity, that the Book of Mormon testifies is the greatest of all—that never faileth, that endureth forever, that all men should have, and that without which they are nothing (see Moro. 7:44–47; 2 Ne. 26:30). “Wherefore, my beloved brethren,” pleads Moroni, “pray unto the Father with all the energy of [your] heart, that ye may be filled with this love, which he hath bestowed upon all who are true followers of his Son, Jesus Christ; that ye may become the sons of God; that when he shall appear we shall be like him” (Moro. 7:48). In the closing accounts of both the Jaredites and the Nephites, Moroni records that except men shall have this pure love of Christ, called charity, they cannot inherit that place which Christ has prepared in the mansions of His Father nor can they be saved in the kingdom of God (see Ether 12:34; Moro. 10:21). The fruit that Lehi partook of in his vision and that filled his soul with exceeding great joy and that was most desirable above all things was the love of God. To love God with all your heart, soul, mind, and strength is all-consuming and all-encompassing. It is no lukewarm endeavor. It is total commitment of our very being—physically, mentally, emotionally, and spiritually—to a love of the Lord. The breadth, depth, and height of this love of God extend into every facet of one’s life. Our desires, be they spiritual or temporal, should be rooted in a love of the Lord. Our thoughts and affections should be centered on the Lord. “Let all thy thoughts be directed unto the Lord,” said Alma, “yea, let the affections of thy heart be placed upon the Lord forever” (Alma 37:36). Why did God put the first commandment first? Because He knew that if we truly loved Him we would want to keep all of His other commandments. “For this is the love of God,” says John, “that we keep his commandments” (1 Jn. 5:3; see also 2 Jn. 1:6). We must put God in the forefront of everything else in our lives. He must come first, just as He declares in the first of His Ten Commandments: “Thou shalt have no other gods before me” (Ex. 20:3). We should put God ahead of everyone else in our lives. When Joseph was in Egypt, what came first in his life—God, his job, or Potiphar’s wife? When she tried to seduce him, he responded by saying, “How then can I do this great wickedness, and sin against God?” (Gen. 39:9). When Joseph was forced to choose, he was more anxious to please God than to please his employer’s wife. When we are required to choose, are we more anxious to please God than our boss, our teacher, our neighbor, or our date? The Lord said, “He that loveth father or mother more than me is not worthy of me: and he that loveth son or daughter more than me is not worthy of me” (Matt. 10:37). One of the most difficult tests of all is when you have to choose between pleasing God or pleasing someone you love or respect—particularly a family member. Nephi faced that test and handled it well when his good father temporarily murmured against the Lord (see 1 Ne. 16:18–25). Job maintained his integrity with the Lord even though his wife told him to curse God and die (see Job 2:9–10). The scripture says, “Honour thy father and thy mother” (Ex. 20:12; see also Mosiah 13:20). Sometimes one must choose to honor Heavenly Father over a mortal father. We should give God, the Father of our spirits, an exclusive preeminence in our lives. He has a prior parental claim on our eternal welfare, ahead of all other ties that may bind us here or hereafter. There are faithful members who joined the Church in spite of the objections of their mortal relatives. By putting God first, many later became the instruments to lead those loved ones into the kingdom of God. Jesus said, “I do always those things that please [God]” (John 8:29). What is the condition in our homes? Are we striving to put the Lord first and to please Him? Fathers, would it please the Lord if there were daily family prayer and scripture reading in your home? And what about the holding of weekly home evenings and periodically having individual time with your wife and each child? And if your child went temporarily astray, do you think it would please the Lord and He would honor your efforts if you continued to live an exemplary life, consistently prayed and frequently fasted for that child, and kept the name of that son or daughter on the temple prayer roll? You mothers who are especially charged with the righteous rearing of the youth of Zion, are you not putting God first when you honor your divine calling by not leaving the homefront to follow the ways of the world? Our mothers put God first when they fill their highest mission within the walls of their own homes. Children, do you pray for your parents? Do you try to support them in their noble endeavors? They will make mistakes, as you do, but they have a divine mission to accomplish in your life. Will you help them do so? Will you add honor to their name and bring comfort and support to them in their older years? If someone wants to marry you outside the temple, whom will you strive to please—God or a mortal? If you insist on a temple marriage, you will be pleasing the Lord and blessing the other party. Why? Because that person will either become worthy to go to the temple—which would be a blessing—or will leave—which could also be a blessing—because neither of you should want to be unequally yoked (see 2 Cor. 6:14). You should qualify for the temple. Then you will know that there is no one good enough for you to marry outside the temple. If such individuals are that good, they will get themselves in a condition so that they too can be married in the temple. We bless our fellowmen the most when we put the first commandment first. “Whatever God requires is right,” said the Prophet Joseph Smith (Teachings of the Prophet Joseph Smith, sel. 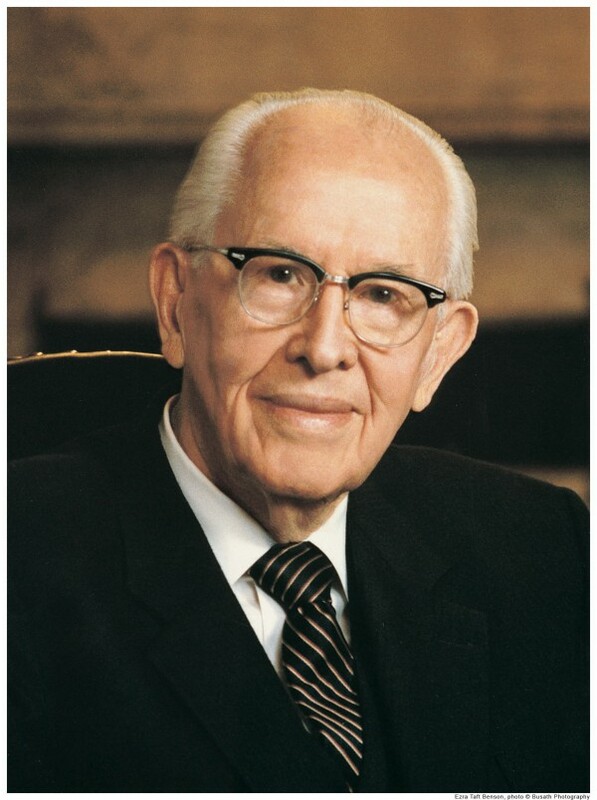 Joseph Fielding Smith, Salt Lake City: Deseret Book Co., 1979, p. 256)—and so Nephi slew Laban. And God asked Abraham to sacrifice Isaac. Had Abraham loved Isaac more than God, would he have consented? As the Lord indicates in the Doctrine and Covenants, both Abraham and Isaac now sit as gods (see D&C 132:37). They were willing to offer or to be offered up as God required. They have a deeper love and respect for each other because both were willing to put God first. The Book of Mormon teaches that “it must needs be, that there is an opposition in all things” (2 Ne. 2:11)—and so there is. Opposition provides choices, and choices bring consequences—good or bad. The Book of Mormon explains that men “are free to choose liberty and eternal life, through the great Mediator of all men, or to choose captivity and death, according to the captivity and power of the devil” (2 Ne. 2:27). Daily, constantly, we choose by our desires, our thoughts, and our actions whether we want to be blessed or cursed, happy or miserable. One of the trials of life is that we do not usually receive immediately the full blessing for righteousness or the full cursing for wickedness. That it will come is certain, but ofttimes there is a waiting period that occurs, as was the case with Job and Joseph. In the meantime the wicked think they are getting away with something. The Book of Mormon teaches that the wicked “have joy in their works for a season, [but] by and by the end cometh, and they are hewn down and cast into the fire, from whence there is no return” (3 Ne. 27:11). I testify to you that God’s pay is the best pay that this world or any other world knows anything about. And it comes in full abundance only to those who love the Lord and put Him first. The great test of life is obedience to God. The great commandment of life is, “Thou shalt love the Lord thy God with all thy heart, and with all thy soul, and with all thy mind, and with all thy strength” (Mark 12:30). May God bless us to put the first commandment first and, as a result, reap peace in this life and eternal life with a fulness of joy in the life to come, I pray in the name of Jesus Christ, amen.